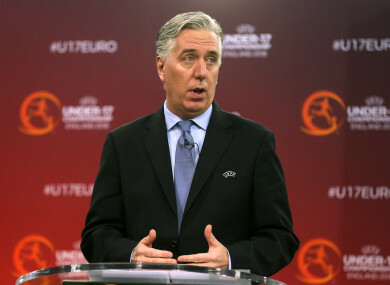 ONLY 6% OF people believe that John Delaney should continue to be involved with the FAI, a new poll has found. A Claire Byrne Live/Amarách Research poll of 1,000 adults yesterday has found that 70% of people believe Delaney should no longer be involved with the FAI after he stepped down as CEO of the organisation at the weekend. Just under a quarter (24%) said they weren’t sure when asked the question. Delaney will now occupy the newly created role of Executive Vice President in the organisation following his resignation as CEO, with protests against him set to take place tonight during Ireland’s game with Georgia in the Aviva Stadium. He has hit the headlines on a number of occasions over the past few week, after the Sunday Times first reported that he had given the FAI a bridging loan of €100,000. Taoiseach Leo Varadkar described the loan as a “bit unusual”, with an Oireachtas Committee set to probe Delaney and FAI officials on this and other matters in the coming weeks. Yesterday, Siptu members who work the FAI expressed outrage over another report in the Sunday Times which claimed that the organisation had paid rent on Delaney’s €3,000 a month home since 2016. With Delaney’s involvement with the FAI set to continue with his new role at the organisation, Irish fans are intending to express their anger at how the game is run here at tonight’s game with Georgia by throwing tennis balls on the pitch. When questioned about this at a press conference yesterday, Ireland boss Mick McCarthy said: “I can’t do anything about it, maybe I’ll take a tennis racket with me. I’m not saying it because I’m back in the job, but our fans are fabulous. I want them to come and support the team and if they have to demonstrate about anything, do it somewhere else another time. Email “Seven in 10 people don't support John Delaney's continued involvement with the FAI”. Feedback on “Seven in 10 people don't support John Delaney's continued involvement with the FAI”.